A favorite subject of masters such Raphael and Botticelli, Madonna with Child is one of Christianity�s most enduring images and a wonderful religious party favor. 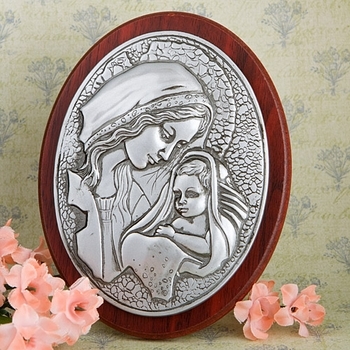 This keepsake plaque will serve as a blessed remembrance of your child's Christening, Baptism or other blessed event. The plaque measures 4 1/2 inches high by 3 1/2 inches wide with a red wood-grain finish. The expressive image is made from carved, pewter-colored poly resin. It also includes a stand and a metal clip for wall display. Each keepsake plaque is presented in a white box. See More Images to see the back of the plaque. Personalized Tags or Stickers are also available($.35 each) if you would like to give these to your guests and add your own special sentiment to each gift box.